The quest for gentility has shaped Chinese civilization and the formation of culture in China until the present day. 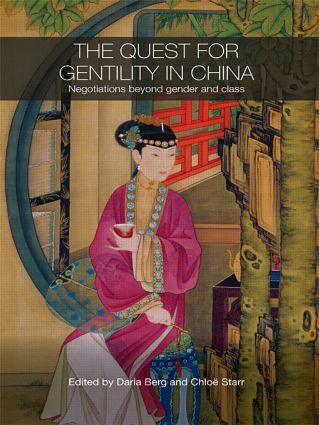 This book analyzes social aspirations and cultural practices in China from 1550 to 1999, showing how the notion of gentility has evolved and retained its relevance in China from late imperial times until the modern day. Gentility denotes the way of the gentleman and gentlewoman. The concept of gentility transcends the categories of gender and class and provides important new insights into the ways Chinese men and women lived their lives, perceived their world and constructed their cultural environment. In contrast to analyses of the elite, perceptions of gentility relate to ideals, ambitions, desires, social capital, cultural sophistication, literary refinement, aesthetic appreciation, moral behaviour, femininity and gentlemanly elegance, rather than to actual status or power. Twelve international leading scholars present multi-disciplinary approaches to explore the images, artefacts and transmission of gentility across the centuries in historical and literary situations, popular and high culture, private and official documents, poetry clubs, garden culture and aesthetic guidebooks. This volume changes the ways we look at Chinese cultural history, literature, women and gender issues and offers new perspectives on Chinese sources.